Dog leads for Arthritis, RSI & Carpel Tunnel Syndrome? 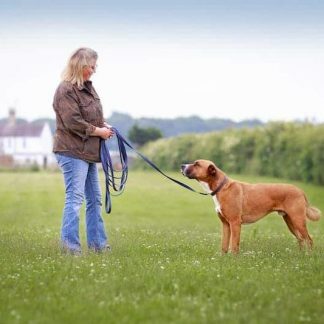 How can it be possible that a lead could be designed to help dog owners walk their dogs? 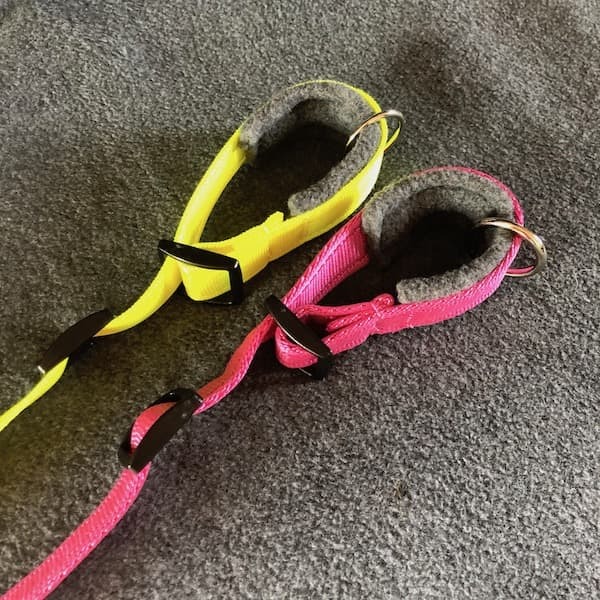 Well, Meg Heath aka Sarah Gleave has made several bespoke dog leads for owners with various ailments that I now felt a blog was appropriate, especially if more people can be helped. 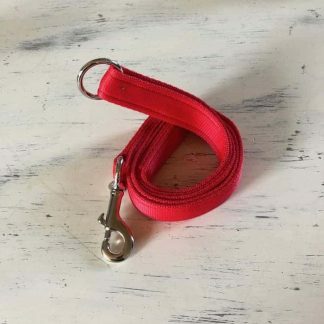 Whoever knew that a dog lead could be made to help with arthritis? Yes, yes it can. Plenty of people have asked me about dog leads to help walk dogs with the symptoms of arthritis. The last design I am most pleased with was for a lady who has 2 dogs – Glen of Imaal Teriers, both of which pulled on the lead, and she had arthritis in her hands & was waiting for a thumb operation. 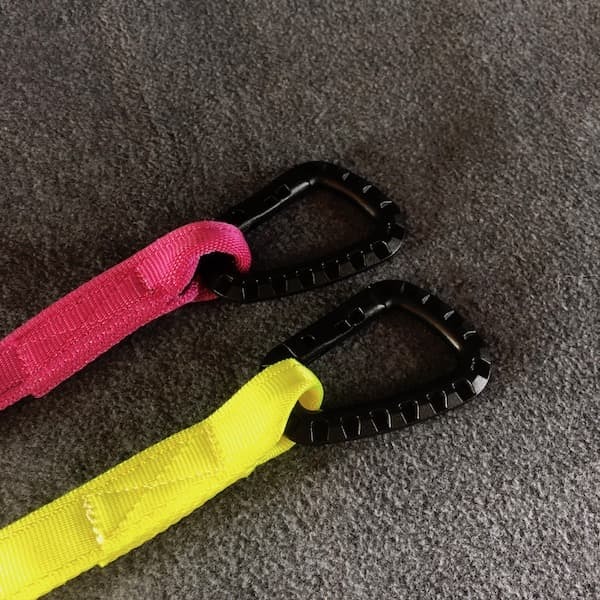 The carabiner of the bespoke dog lead that attaches to the dogs’ collar. I designed a lead with a padded handle that was also adjustable, it was tailor fitted to the size of the ladies hand and pulled snug around her wrist so that she did not have to use her fingers. The lead was sewn in a manner that meant the handle loop would not go too big, just an optimum size for the job required. She also ordered a walking belt with carabiners that the dog leads would fit to. This was a new one for me, but the design came easy. The customer made a suggestion of what they wanted and I made a suggestion on how to improve the design. This is what we came up with. The dilemma was to be able to hold 2 dogs easily on one handle, but that the handle was an option for only when required. I padded the handle more than I would with a normal dog lead but not too much that it got in the way. 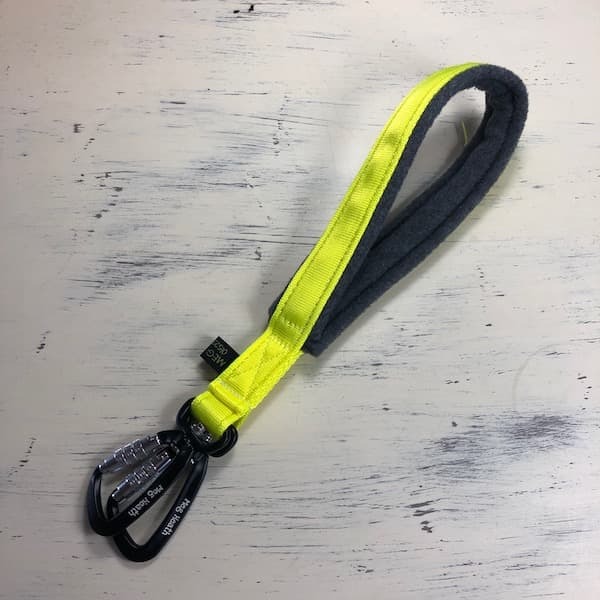 The customer requested fluorescent yellow with a padded handle, I suggested the grey as I think it compliments most colours and is a hardy colour. I was really pleased with this and I think it looks great in those colours too. If you have an idea that solves a dog walking dilemma for you, give me a call or drop me an email or a message. I have never turned a challenge down. 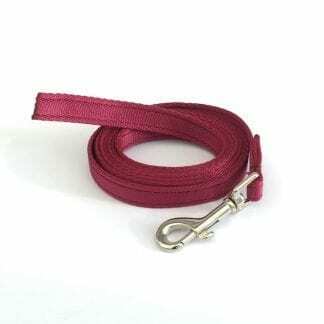 The only thing we don’t do any more is embroidery on dog leads & collars.